Belly Bump Balls are a fun way for kids and grown-ups to bump, bounce, and run into each other—outdoors or in. 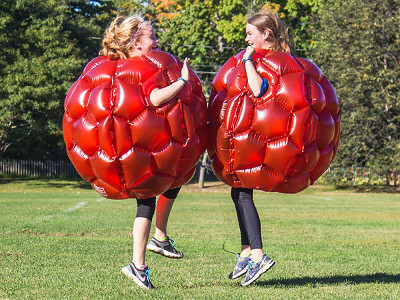 These inflatable raspberry-shaped suits are covered in tough vinyl bumper balls. Once the suit is fully pumped, you can bounce, roll, try to knock down your friends, and get some exercise in the process. But the story of the Belly Bump Ball isn’t all fun and games. It was actually developed to help both adults and children alike safely work through anger issues with a physical way to vent their negative feelings. Before long, though, the Belly Bump Ball found its way into toy fairs, to an overwhelming response. Belly Bump Balls are packaged in pairs, if you’re up for some friendly—and very goofy—competition. And if you want to bounce solo, you’ll find plenty of ways to do it. Either way, because your arms, legs, and head are exposed, you can retain control and balance. We can attest: It’s virtually impossible not to smile wearing these inflatable suits. So embrace your inner silliness and have a good bounce. Hello everyone! I'm proud to introduce the Belly Bump Ball to The Grommet. I'd be happy to answer any questions you have! Yes they are,Cyrus! Made of 100% vinyl! Christine, what is the weight/height limit for each size? I'm thinking about getting a pair for grandkids who are around 10 years old but a little chunky. And if I got a pair for their parents, I'd need to know that both parents would fit inside them. Thanks! Hi Joanne, your best bet would be to get the larger sizes for all of them. The smaller sizes are more for 3-6 year Olds so your grandkids have already outgrown them. There's a great deal of padding and we have never had any issue. We will look into helmets though. Thanks for the suggestion. This really needs to be shown and advertised with the kids wearing a protective helmet. Take it from an ER/Critical Care Nurse. But, my first thought was....they need to wear a helmet. Even in the video that you show, their heads are coming so close to the ground. Hi Kathie, Safety comes first always so you most certainly can wear a helmet for extra protection. The width of the Belly Bumps should keep you from knocking heads with someone else, but a helmet would provide another layer of protection just in case. Hi Debby, I have asked the maker Christine to get back to us with this information. She will weigh in when she has the details. Thanks! @Meredith In selling these for years, we have never had any incident of injury reported. Hello Christine, I wanted to know does this open up to put on? And does it have a zipper or buttons to close while wearing it? Hi Tawonia, Once you inflate the Belly Bump there is an opening at the bottom to slide it over your head and put your arms through the sides. It is all one piece no zippers or buttons to keep it closed. How does it work if the two participants are mismatched in size, say an adult and a 7 year old? All your pictures show people the same height. How could they bump? Hi Nancy, they come in sets of two of the same size which is how its recommended to be played. People of different heights can play together but the area of contact will be different. Everyone should use their best judgement to keep everyone safe. Hi @Nancy -- Thanks for the question. My daughters are the two girls pictured, and I put on the Belly Bump Ball for a while, too, during the photo shoot. It was pretty fun to let my 10 year old try to knock me over by bumping into me, but I also was careful not to use too much force in return. The Balls provide a lot of cushion and they fit loosely, so it's easy to maneuver your body to keep safe and flexible. How many inches is it from the neck of the ball to the bottom? That would help me decide what size I would need to get. Also how rugged are the balls? @William Hi William, The Belly Bumps are made of durable vinyl so they are pretty rugged. They come with a patch to fix it just in case. The large is around 36" from the neck to the bottom and the small 22". Hi Andrew, Thanks for checking out the Belly Bump Ball. We absolutely agree that a helmet is the best way to protect yourself in case you fall. I am a doctor and this makes me cringe. The unprotected limbs, head, and neck are at risk and I can't believe children with unfused bones are encouraged to use this. What safety precautions are included in manual? @Bonnie - Thank your for sharing your concerns. We are checking in with the maker to get her response. And I'll add, too, that my older kids liked how wearing the balls challenged their balance and centers of gravity. All kids are different, of course, but their natural play in the Belly Bump Balls was active and exploratory -- can I run, can I kick, can I roll? what happens when I fall? -- than competitive. I see your point, and am a naturally worried mom. I wasn't overly concerned when I saw my girls use it, but I appreciate your comment, and will ask the maker to share her thoughts, too, on how the design encourages active play and guards against injuries. They ARE loads of fun, Karen! What's life without a little risk? As Kate and Meredith have said, and as I'll echo, please take the proper safety precautions when using Belly Bump Ball. With careful play, you can ensure there is more good than harm! @Mike I agree wholeheartedly that sometimes we get so worried about safety that we forget about having fun. I grew up in the 60s when there were no seatbelts in cars and not a bicycle helmet to be found. I'm not advocating that we ignore what we've learned about injuries and instead know we must keep safety in mind when we are teaching our kids about safe play. But I do not think it is the manufacturer's responsibility to make everything so safe that parents don't need to supervise and teach their children about the correct ways to play safely. So, lighten up everyone and have some fun. Hear, hear, Cindy! Thanks for the comment! They are a little pricey. Are they durable? Hi @Sandra - Thanks for the question. They are made of a thick vinyl and are designed to be durable. A puncture could damage them, though, and a patch is included just in case. The first thing that popped into my head was wondering how likely someone would hit their head on the ground if they got hit hard enough to flip over instead of merely fall over or get whiplash if knocked over backwards, with the head still in motion after the device hits the ground. Also, if a kid gets knocked into a pool that could get kind of iffy depending upon which side ended up. The product is a cute alternative to the Sumo Suit and it looks like it could be fun, but it also looks like there are risks involved. I am also interested in info on the type of injuries that have been reported and the type of safety precautions included with the instructions. @snype - Hi Snype! First, I have to say that I personally wouldn't let kids near a pool wearing a Belly Bump. The scenario you outlined makes me catch my breath! I've been thinking through how to better describe the physics of the Balls, and their bounciness. There isn't usually a hard, jarring stop because of how they're inflated. They also don't fit snuggly, so even on a grown-up, there is room to get your arms and head inside the ball and tucked in protectively. And we will keep you posted on what we hear from the maker. I concur with Kate, this should not be used near a pool. It may look like a flotation device, but it is not! I agree completely with Snype...the head continues in motion after the ball hits. Please refer to the comment that I made regarding 2 teens that were in Sumo Suits and the resulting tragedy. @Kate Thank You. To most kids anything inflatable means playing in water, even if told not to. It would be good if up front they described why and how the product is safe, to eliminate concerns for future customers who weren't lucky enough to participate in the discussion. That's a great call, Snype! We will work to get it included in the details section and talk to Christine about putting it into the safety precautions if it isn't already! I feel obligated to post this, in hopes of preventing another tragic accident. I was present when two 17 yr olds were in similar balls at a school event. They hit hard, causing one girl to fall backwards, hitting her head on the gym floor. She had a severe head injury and died 2 days later. If you have to use these balls, wear a helmet!!! @Janeen - We are very sorry to hear about this tragedy in your community, and we appreciate that you posted here. We agree with you about helmets and safety precautions. Hi Ronna, thanks for the comment. Most toys pose some risk. Our CEO has a friend who would not let his kids play with Pick-Up sticks because of the risk of an injury. We are a group of parents and reasonable people who are super sensitive about meriting your interest and trust with our Grommets. It’s a balancing act and it is that as well with Belly Bump. Respectfully, I disagree with the outlet for aggression. Having a child let out some steam with the Belly Bump Ball is a lot more productive than some other ones I can think of. Mainly because they are so much fun! Do the large size balls fit plus size adults? Hi Stacy, thanks for the question! It will depend. The diameter is 36.5" all around, but the material itself is fairly flexible. Belly Bump Balls are a fun way for kids and grown-ups to bump, bounce, and run into each other—outdoors or in. 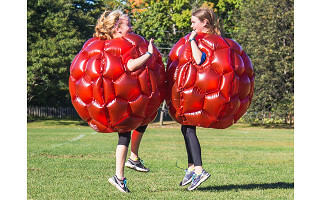 These inflatable raspberry-shaped suits are covered in tough vinyl bumper balls. Once the suit is fully pumped, you can bounce, roll, try to knock down your friends, and get some exercise in the process. But the story of the Belly Bump Ball isn’t all fun and games. It was actually developed to help both adults and children alike safely work through anger issues with a physical way to vent their negative feelings. Before long, though, the Belly Bump Ball found its way into toy fairs, to an overwhelming response. Belly Bump Balls are packaged in pairs, if you’re up for some friendly—and very goofy—competition. And if you want to bounce solo, you’ll find plenty of ways to do it. Either way, because your arms, legs, and head are exposed, you can retain control and balance.